In case you missed it yesterday, Teddy Treasures are an amazing new sponsor to the blog and I am so excited to have them on board as we just love Teddies and Soft Toys in our place at the moment!! You can read all about Teddy Treasures and see what I am loving from the huge and fabulous range in my previous post here. I am even more excited that Teddy Treasures have kindly agreed to give one very, very lucky reader the chance to win a whopping $100 Shopping Spree Gift voucher to spend over at the Teddy Treasures online store. 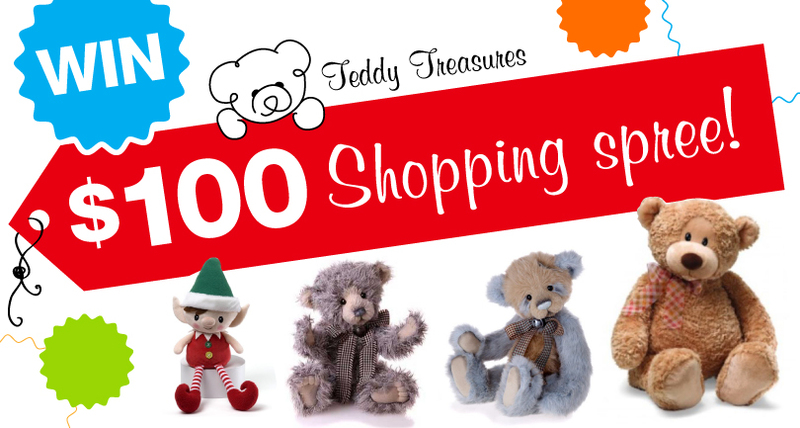 With the Teddy Treasures prices so reasonable, this is bound to go very far and just in time for Christmas too! Entry to this amazing competition is by Rafflecopter below and please note the conditions of entry below. OOoops I deleted my own comment lol Great prize! Fingers crossed! Great giveaway, and perfectly timed for Christmas. They are beautiful. Certain my grand-daughter would cuddle them to death. My kids would love one of these gorgeous teddies. Hamptons Style Summer Print Giveaway!!!! Do you Love Teddies as much as Mr B?! Free Christmas Printable... by Vote! !